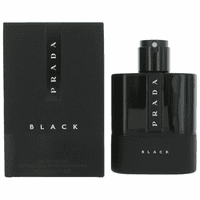 The latest iteration of Prada Luna Rossa, Prada Black comes on energetic but leaves a distinct impression: the sense of excitement one feels when discovering a new side to his own cityscape. Like a vivacious hub full of possibilities and dangers, sweeter details fizz over woody amber for a mesmerizing effect. Bergamot and angelic slowly build and crash with seductive, masculine energy. Top Note: Patchouli.Heart Note: Ambergris. Base Note: Coumarin.